Hello and Welcome to our preview for Wellington vs Auckland match. 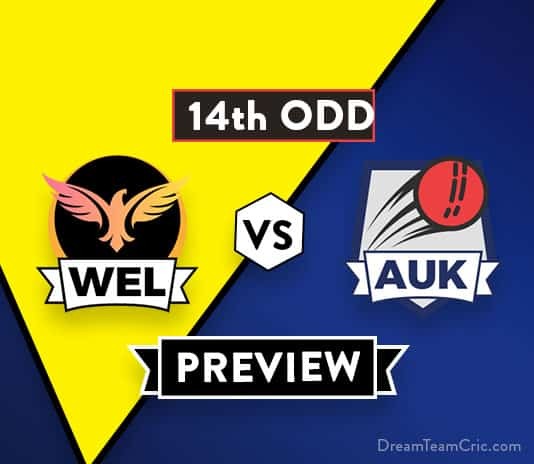 We are covering WEL VS AUK 14th ODD Dream11 Team Prediction, Preview and Probable Playing XI for the ODD match. The match is to be played at Basin Reserve, Wellington. Team Wellington is in good form and is currently on top of points table with three wins and one loss. In last match, They defeated Northern Knights by 39 runs. Andrew Fletcher and James Neesham starred with bat scoring 64 and 86 respectively to lead team to a target of 269. Skipper H Bennett was lethal with the bowl taking four scalps while M Nofal took three wickets and Ben Sears took two wickets to successfully defend the target. They will hope to continue the momentum ahead and retain their top position in points table. Auckland is right behind Wellington with similar three wins and one loss to their name. They also won their last encounter by 3 runs against Canterbury. Craig Cachopa was the star with bat scoring a brilliant century and was supported by Michael Barry and William O’Donnell both scoring in 40’s. G Beghin also played quick cameo of 32 runs in 18 balls to lead team to a total of 270. Danru Ferns bowled exceedingly well taking a four wicket haul to win the match by 3 runs. They will hope to get the top position by defeating Wellington. A good match can be expected between both top teams. WEL VS AUK, 14th ODD, The Ford Trophy 2018. Hamish Bennett (c), Andrew Fletcher, Ben Sears, Jakob Bhula, Michael Bracewell, Jimmy Neesham, Devon Conway, Lauchie Johns, Iain McPeake, Ollie Newton, Malcolm Nofal, Peter Younghusband. Craig Cachopa (c), Finn Allen, Danru Ferns, Ben Horne, Mitchell McClenaghan, Sean Solia, Will Somerville, Michael Barry, Graeme Beghin, Jamie Brown, William O’Donnell, Michael Snedden. They have declared unchanged 12 man squad for the match. Malcolm Nofal, Andrew Fletcher, Devon Conway and Michael Bracewell will be the key batsman. Jimmy Neesham will play the role of all rounder. Peter Younghusband will lead the spin attack along with Malcolm Nofal while Jimmy Neesham, Ollie Newton, Ben Sears and Hamish Bennett will be the key pacers for them. They have declared same 12 man squad for the match. Sean Solia, Craig Cachopa, Graeme Beghin and Ben Horne will be the key batsman. Michael Barry and William O’Donnell will play the role of all rounder. Will Somerville will lead the spin attack along with William O’Donnell while Mitchell McClenaghan, Jamie Brown, Michael Barry and Danru Ferns will be the key pacers along with Sean Solia. Malcolm Nofal, Andrew Fletcher, Devon Conway, Michael Bracewell, Jakob Bhula, Jimmy Neesham, Peter Younghusband, Lauchie Johns (wk), Ollie Newton, Ben Sears, Hamish Bennett (c). Sean Solia, Finn Allen, Michael Barry, Craig Cachopa (c), William O’Donnell, Graeme Beghin, Ben Horne (wk), Will Somerville, Mitchell McClenaghan, Danru Ferns, Jamie Brown. Captain and Vice-Captain choices: Sean Solia, J Neesham, M Barry, M Nofal, A Fletcher, C Cachopa. If you liked WEL vs AUK 14th ODD Dream11 preview, then follow us on Twitter for Latest Cricket News.